If you have plans to setup quality audio video systems in your home, you need to consider several factors. It is not an easy step of just purchasing the systems and installing. When you are implementing latest home automation technology in your house, office or other commercial areas, it is best to get assistance from professionals who offer home theatre audio video solutions. This way, the entire installation and setup process becomes simple and at the same time, you can achieve a quality sound system. We all know that home upgrading is a complex process. It can at times result expensive or above your planned budget. Therefore, it is important to make use of right technology to make sure the house or commercial area is upgraded with best products that last longer. 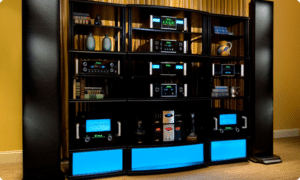 When it comes to installing audio video systems for the entire house, you need to use some special equipment to experience better sound quality in all corners of the house including the outdoor garden. If you wish to enjoy high definition sound from any part of your house, then you would need smart speakers, matrix switch, amplifier, and controller. It is the most important feature for the entire audio-video system that aids to make listening a breeze. High quality and versatile speakers help you to experience interrupt free music with better voice quality. If you are thinking to install for a single room, the entire setup process is easy. But when you are setting for the entire house, you would not know the areas to focus. If you wish to enjoy high fidelity audio in the entire house, you should get some professional assistance. It is recommended to include a set of speakers along with your existing home audio system. It helps you to enjoy perfect sound quality from all areas in your house. Amplifiers helps you to enjoy uniform audio all throughout the house with missing that quality sound quality. There are various kinds of amplifiers easily present in the market. It helps to enjoy sound about eight spots in your house, which means your entire family can listen and enjoy same music in about eight spots simultaneously. To be clear, the amplifiers should have quality features that help you hear music in the living room, backyard or bedroom quickly and easily. Easy to manage the entire automation systems than managing the kids? Matrix switches or the traffic controller: Matrix switches functions almost like a traffic controller. It aids in directing the signals according to the amplifier. The advanced switches can convey about 4K video signals in the home theatre, bedroom or living room. For example, if you want to pause the movie you are playing from the bedroom, pause and watch in the living room, it is simply possible. The matrix switches are used in replacement of AV clutter which is helpful in playing content. How to select an experienced audio and video solutions provider? A team with expertise and knowledge: It is best to hire a team that has technical knowledge and expertise to develop innovative solutions. A good firm would keep looking for modern solutions and remains updated about the latest evolvement of technology. When a company has lot of knowledge and experience about a particular technology, you can easily trust the company for best solutions. Such companies would have been working with technology for several years and aim to deliver result driven solutions. A professional audio and video solution company and its team would have in-depth knowledge and expertise in AV systems, equipment, security and networking and AV signal flow. It is important to select a firm with all the above-mentioned qualities. It is sure you would find the above guide helpful for installing and working with a professional hometheatre solution provider.